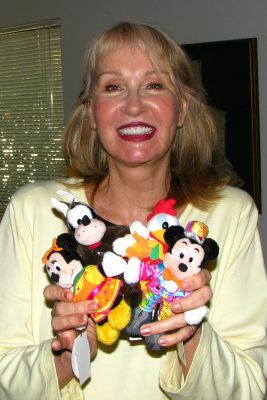 For decades, Alyja Kalinich was a costume designer for Disney, and her work has been seen all over the world! Her costumes include many characters, overdressing for characters, and an almost unimaginable array of designs for Disney’s many parades and shows at Disney theme parks here and abroad. 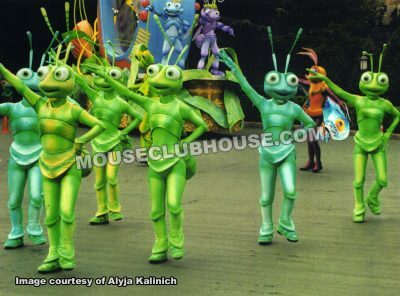 Alyja has done costume design for Disney on Ice, the New York City Ambassador Theatre, and Radio City Music Hall. 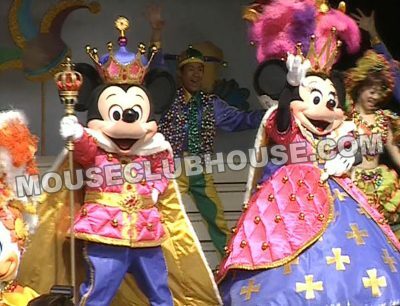 She had to take so much into consideration when designing, such as where to place the battery packs and LED lights for the costumes she designed for Tokyo Disneyland’s Electrical Parade Dreamlights. 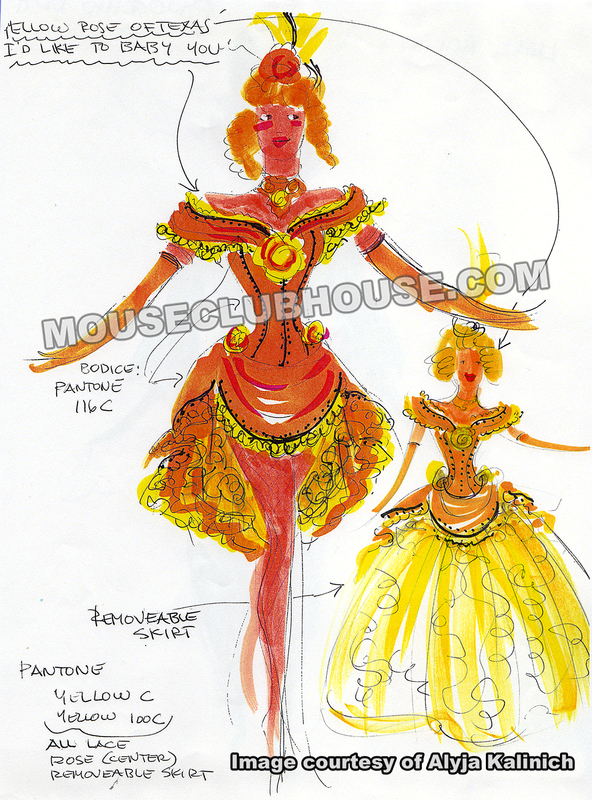 In fact, an update to that parade in 2015, including lighted Rapunzel and Flynn costumes, would be her last designs before retiring. 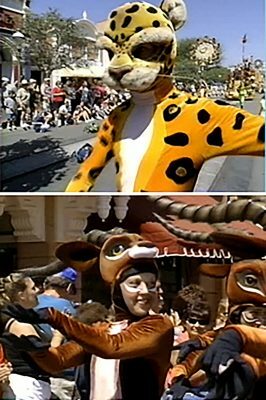 From Roger Rabbit, Aladdin and the Genie, to dancing seaweed, dancing film strips, insects, cheetahs and gazelle – the thousands of costumes Alyja has designed has brought joy to millions of people. 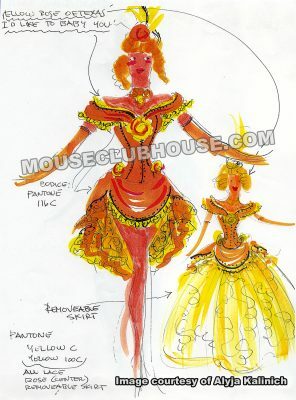 Scott Wolf: How did you get into designing costumes? Alyja Kalinich: I went to art school. I majored in fine art at St. John’s University and then transferred to Parsons School of Design in New York. I studied illustration, and that was going to be my career… to illustrate. When I finished there, I came to California on a vacation and loved it so much. 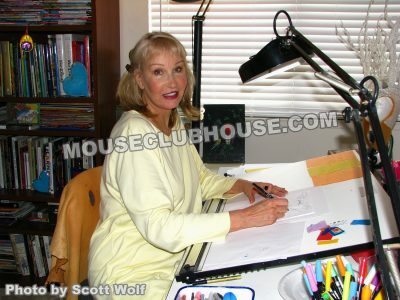 Before that, I started working for Oleg Cassini, who was a designer in New York, and doing his illustrations because a lot of designers can’t really draw very well – they do stick figures. I happened to have a saleable way of drawing, so they would use me to do their sketches, and some of them don’t have time, so I would do them. Then I went on vacation to California and loved it and said goodbye to all my friends in New York and goodbye to Oleg Cassini. I decided to start a new life in California, and he actually came out two weeks later to do a film and he asked me to be his assistant designer on the film. So it worked out that I got into that and kind of saw the designer’s actual working, not just the sketch. After that finished, I went looking around and found Disneyland and I thought, Well, okay, I’ll go by and check it out and see if there’s any design with sketching involved of any kind, because I could do interiors and all that. I was hired by Bob Phelps and Tom Peirce. 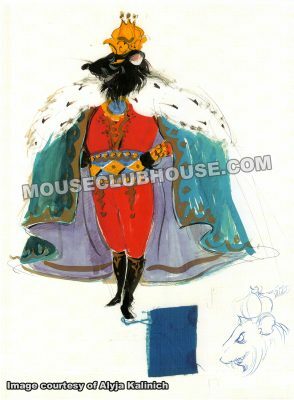 I believe Tom Peirce and Jack Muhs were the very first designers there, and they hired me as their sketch artist and I would do their sketches. They would of course have to present their designs and their ideas to the producer of the show and all that, so their idea would go with my sketch and they would talk it through and so on. I did that for a number of years and then they needed a designer so they put me as an assistant designer first. Larry Billman helped me actually helped me. It was serendipitous. Life is so serendipitous really. You can plan all you want, but it just takes you where it goes if you don’t say no. 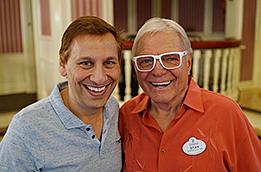 Larry rushed down to me, and he said, “Jack isn’t here, I need a design for Bob Jani,” who was at that time the big entertainment guru there. So I did a sketch and he took it from me and presented it to Bob Jani and Bob liked it, so it became my turn to actually art direct it, too. So that was my first thing. I remember it was kind of a bland look but I learned a lot from my very first experience and I owe it to Larry Billman, and the fact that Jack wasn’t there. Then they put me on to other things and it came on and on and then I did parades. “The Lion King” parade, I did that one. SW: That had spectacular costumes. Which ones did you work on for that? AK: I did all the costumes for the parade. SW: The gazelles and and cheetahs and zebras? Those were a very unique style. Just beautiful. Was that the first time that Disney did kind of an artsy kind of animal like that? AK: Yes, it was the very first time. The whole parade was a little bit of an abstraction. That was told to us by the producer/director so that was their input to us, the set designer and the costume designer. Then we, inspired by their thought, stepped away a little bit from reality. It was great fun. SW: Did you have to do any kind of research for those costumes? AK: Always. Before you begin a project, you kind of ruminate what goes on in your head through the days as you do your regular stuff, it’s in the back of your mind. Then I have tear sheets, every time I look at a magazine I always pull stuff out and put it away, and all of that stays in your mind and the act of seeing and that recognizing what you’ve seen that it could be like a hook to something. Taking and saving, all of that is a constant process in the life of a designer, I would think. A constant process, life is never dull. SW: So you were no longer the assistant by the time you did “Lion King”? AK: Right. I was a designer then. SW: Were you working strictly for Disneyland at that time? AK: Yes, I was on staff for 20 years. 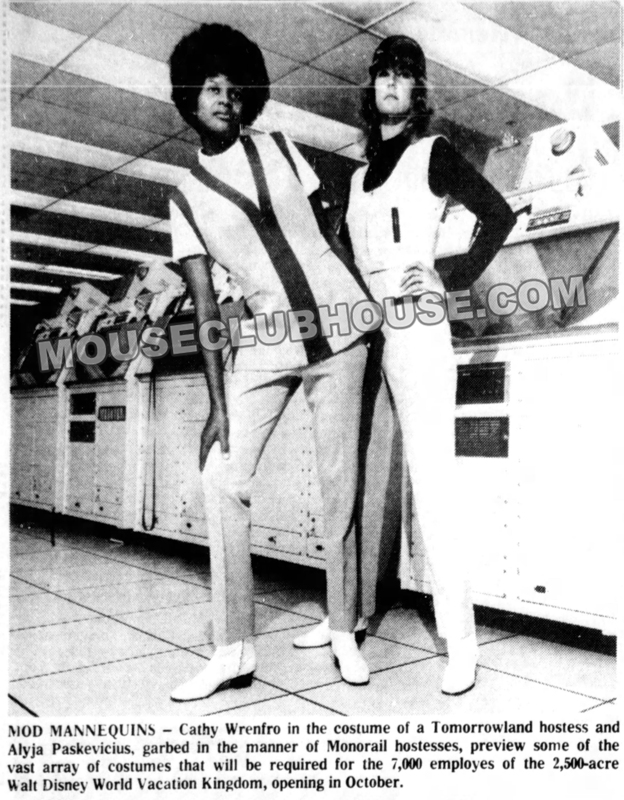 When I was an assistant, I did go to Walt Disney World for awhile when it opened. My name is on one of the store fronts in Disney World! It’s my maiden name, Alyja Paskevicius! I couldn’t believe it! It’s there still! SW: That’s awesome! So you were there for the opening of Magic Kingdom? SW: What kinds of costumes did you do back then in the ‘70s? 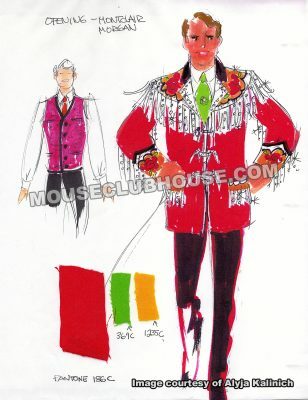 AK: That was the beginning of the park so there were a lot of operational costumes that I did drawings for Tom Peirce. SW: What do you mean by “operational”? Is that like shops and restaurants and things? AK: Yes, like what your wife wore (when she worked serving food) at Carnation. SW: So you were working on a lot more than just shows and parades. AK: I did both for Tom Peirce who did operational and for Jack Muhs who did entertainment. 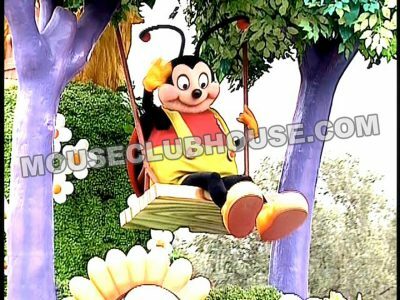 Tom Peirce is such a part of Disney history, and Jack Muhs, too, he’s passed away. He did the costumes for the Golden Horseshoe and then I redid them toward the end. SW: What was the process when you would start designing, like a parade? AK: The producer and the director come to you, the designer. Usually the director comes and says we’re doing this parade or this show, and they give you the script or they give you the number of units in a parade, the general idea of the whole thing and the number of people, the number of men and women. They give you a lot of the technical details plus the general feeling and an inspirational talk as to what the story is, and what the music will be like. Then you go back to that little room or wherever, and you come up with your concepts. Then you have a meeting and you present the concepts. I tend to like to do the whole parade rather than one costume at a time, because then you get a general overview in your mind’s eye. So you present that to usually the director and the producer, and they’ll say, “This looks good, this looks good, let’s change this, let’s do this different,” or whatever. It’s a very malleable process and you just stay flexible. It’s a group thing, but you have your own contribution. Then the set designer comes in and he has the same process. Then we all come together and we look at all the work together. The music comes in and we get approval on what to begin with and then we go to the prototype costume first. What I would do then is take my sketch that has been finally approved by the show director and the producer. Take it to a costume house, which is sort of like how an architect would have a contractor. The architect goes to the contractor and says, “I would like this built, how would you do it? Let’s talk about what the materials would be,” and so on, so in that sense I go to a costume house and I would say, “Let’s talk about this. I would like this, this big, maybe a cage,” or whatever thoughts I may have and then listening to their experience. I need them badly because they’re the people with a lot of good thoughts, so I welcome everything. That’s where you really have to communicate. Communication is pretty big in this process, and then to inspire them to really get the essence of it, of that elephant or whatever you’re doing, the essence of it so that they would understand it and be excited to do it. SW: When you set out to design something, do you have to worry about limitations, like is it even possible to do something like this, or do you shoot for the moon and see what the costume house can do? AK: I know what can be done. I know that I can’t have someone fly in the air without wires or that I need a harness if they’re up in the air. I know that from experience. So I do take that into account already. But if there’s new materials, plastic materials say, new types of fabric that I haven’t seen out there yet that they may know about, I welcome all those new ideas. I welcome everything from them. But I do know my limitations, and also the budgetary limitations and the time. The clock is always ticking behind me. SW: Out of everything you’ve worked on, do you have a favorite project? 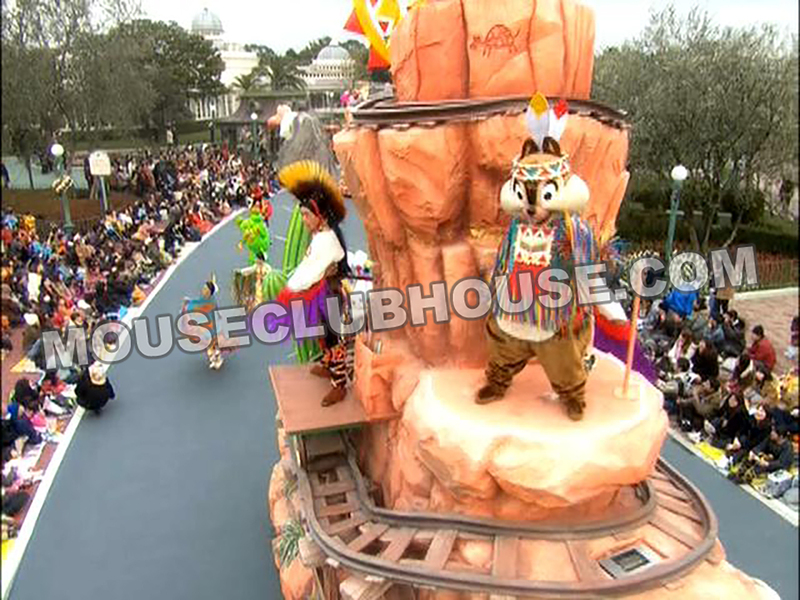 AK: I guess “The Lion King” parade. 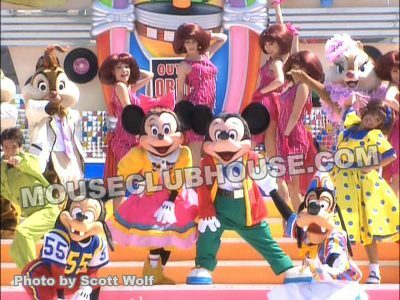 That to me is everything, because of the music, too, it makes me kind of get a tear in my eye, but I love a lot of the stuff I did for Japan, and I love some of the Muppet stuff I did in 3-D, for the characters in Walt Disney World. I learned a lot about their quality of work because their art is softer and Disney art is more hard-edged. 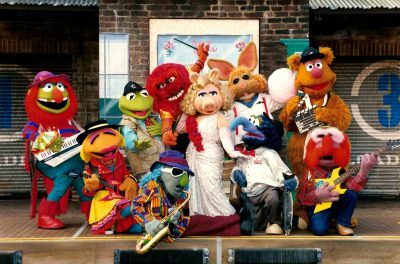 The Muppets have a lot of soft flowing things. I learned a lot from going from one kind of discipline to another, I was very fortunate. SW: Did Jim Henson have to approve your work? AK: Yes, but he died right then. It was just so horrible, and then someone else had to approve it, but he was such a nice guy. Such a tragedy. SW: I know you worked on my favorite parade Party Gras, I saw the photo of the banana character in your other room. AK: Most of the parade was done by Jack Muhs and I just contributed the new characters. That’s how it worked. That was assigned to me because I like to do little new characters or think them up. SW: I saw you designed a seaweed costume. What’s the strangest costume you’ve done? AK: Maybe the elephants for Radio City Music Hall. SW: Was that the live Magical World of Disney show? AK: Yes, the elephants, we did sort of a black light elephant dream sequence from “Dumbo” and we had them stretch and jump around. It was a good effect. SW: What was that Magic World of Disney show? SW: Was that the biggest show you’ve done? AK: I did an Ambassador Theatre one for the premiere of “Hercules.” That was a big show as well. Every one of them is pretty detailed. Most of my projects have over a hundred people in them. SW: Were you working for Disneyland when you were asked to do the Radio City show? AK: Yes, it was all Disney, through Barnette. Barnette came to ask me. She was on staff in entertainment at Disneyland, so we were all kind of a group. SW: Which “Disney On Ice” shows did you work on? AK: “Pocahontas,” and a lot of the characters for the other shows, overdressings for like Mickey and Minnie and stuff like that. SW: Overdressings are like the character’s “wardrobe,” right? AK: Yes. It changes the look of the character. The character still remains Mickey and Minnie but maybe has a raincoat on instead of the little dress that Minnie’s wearing. That’s an overdressing. SW: When you design for ice shows, is it different than a stage show or a Disney parade? AK: Oh yes, it’s a whole different venue and different needs for the person. They have to move quite a bit. It’s quite another world. Also, if you are doing an indoor show, it’s a whole other world than an outdoor entertainment because outside it’s very unforgiving. There’s no lights to hide behind. The lighting designer can help you with your costume, make them look more mysterious, the moodiness. You have to create that mood right there in the sunshine and it’s a strange little world, outdoor entertainment. 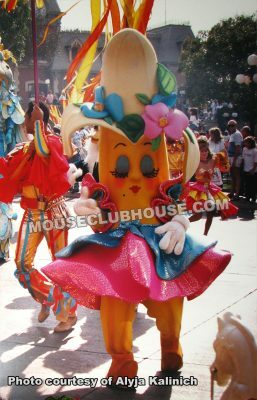 You also have to have that costume be a focal point as you’re looking at it because behind that costume there are myriads of people, taking your attention away from what’s going on in the parade. There’s all kinds of faces, colors, and all of that. You have to keep that in mind and you have to make sure that when the person sees the costume up close that it looks like a well-made piece and that it has the quality of the thing that you’re trying to portray up close. It’s very unforgiving. It’s not very easy. I think theatrical design is easier because you’re in the dark, you can collaborate with the lighting person and determine color – it’s a lot more forgiving. SW: You mentioned the lighting people a moment ago. What other people would you deal with? AK: On every production it’s the director, the set designer, the lighting designer and the costume designer, working together, and the choreographer as well. SW: Why would the choreographer work with you? AK: If for some reason the person can’t move properly with the costume I’ve done, that I’d need to fix. That’s my problem unless we collaborate and they do a little less choreography and I do a little fixing on the costume. It’s very collaborative. SW: Some characters have extravagant makeup, like some of your costumes for parades, flowers for example, also have flowery makeup on their face. Are you involved in that? AK: Yes, I approve the makeup during dress rehearsal. We work out every problem that we can work out at dress rehearsal. We usually have a few dress before we do the final dress, and by the final dress all problems should be worked out and makeup should be the way it would be on the opening day. So yes, makeup is part of my thing, and also hair. It is a hard job and it requires a lot of people cooperating and coming together and working with a lot of different personalities and a lot of different time frames, the money, all of that. But the final happy time is when you see the people looking at it and you can see the faces and you can tell there’s something in them that’s lifted up a little or taken away from their cares of the day by something visual and something musical. Those two things. Those two things can transport you to a much different world than the world you’re in. So I could see that. And then I look at the things I could have done better and then I look at things I like, too, so I bask in that, I don’t negate that, but then I think, “Next time this…” but it’s the reaction of the people.